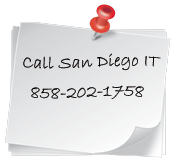 Expert IT management for your business and unmatched support for your users. Fixed cost computer and network support for your business has never been more affordable. You aren't still using tapes are you? Get the latest in backup technology in the cloud and onsite for the ultimate in backup and recovery. Instant support online or over the phone. Click here to connected with a technical support representative. Changing IT providers or hiring your first IT consultant can feel like a daunting task. Are they reliable? How much will it cost? Can they solve our computer issues promptly? We’ll you’re in luck, we can do all that and quite a bit more for a fixed predictable monthly cost. Call us now for a free no obligation onsite network assessment. Copyright ©2010-2019 San Diego IT. All rights reserved.